Every so often we get pictures sent in to us, and we know exactly what it is. Ugly frankenstein development mules and pre-production prototypes that never see a showroom floor make it to us, too. And every so often we get something that looks production ready, but there's still room for a question mark. This particular prototype was spotted outside Honda's Marysville, Ohio plant, so that narrows it down a bit. Even still, the mark on its grill suggests that either the Pentastar is coming back, this is a scary Chinese knockoff, or someone's trying to hide something. 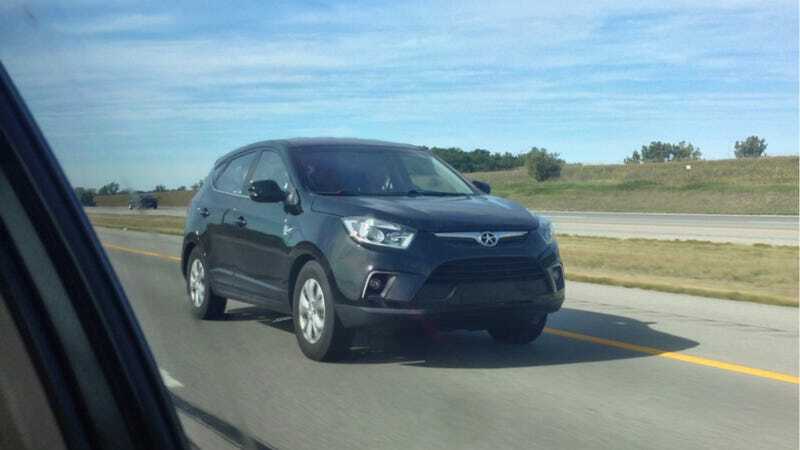 Eric, the tipster who sent these shots in, guessed that it's a prototype for the new Acura RDX, though I'm thinking this is closer to a Honda CR-V. I'm also seeing a lot of Honda's Urban SUV Concept in this one. Or maybe it's a Hyundai. Or the Porsche Macan. Or a new VW, since they're in Ohio, too. Or maybe it's the Gallardo replacement. But what do you think, o Jalopnik commentariat? What the hell is this? UPDATE: It appears, on the outside at least, to be a Chinese JAC S5, though who knows why someone would import one into the US, let alone a manufacturer. Could something else be running under the body panels? For what it's worth, JAC describes the S5 as "extremely fashionable, powerful and energy-saving," so there's that. The plot thickens.